Recap: To refresh an 1868 farmhouse—the very place where her father was born—for her retired parents, architect Mhairi Grant raised the roof, allowing walls to be extended 3 more feet. She then converted the entire dwelling into a capacious, contemporary kitchen with a vaulted ceiling. Glass walkways on either side of the original homestead now connect to barn-like additions housing living areas and bedrooms. The new structures are clad in Siberian larch slats that weathered to a silvery gray—a neat complement to the kitchen’s neutral palette of ice-white solid surfacing and moody, rain cloud–colored rubber flooring. Recap: To maximize the roof’s 15 solar panels, the architects oriented this compact 1,080-square-foot home—a Passivhaus design—toward the sunniest exposure. To keep the interior from overheating as a result, mammoth steel panels sheathed in heat- treated pine slide across the exterior glazing, blocking rays and instantly changing the face of the home. Inside, a simple tiled wet room and kitchen tucked unobtrusively under the slanted ceiling can be serviced by a rainwater retrieval system. The sum of these eco-friendly measures? Zero net energy. 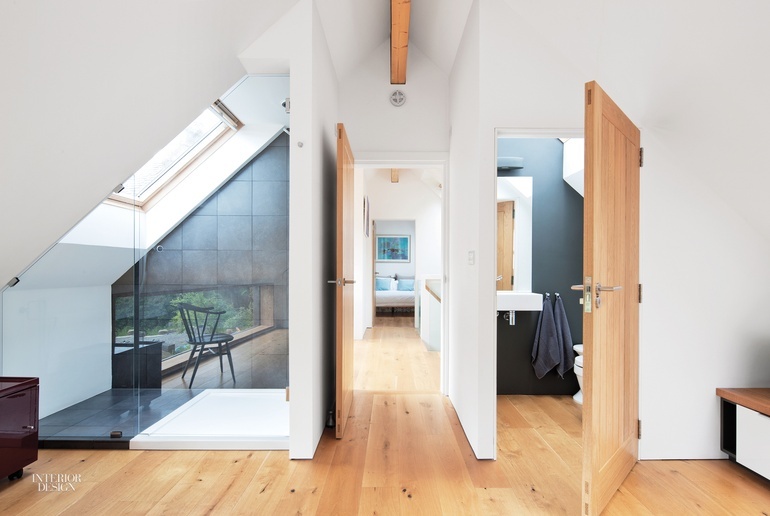 Recap: Inspired by the blackbirds commonly seen in the area, architect Haiko Meijer and designers Peter van der Knoop and Koen Looman crafted a home for a family of four in larch—charred black according to Shou Sugi Ban, an ancient Japanese technique. Nestled under its A-frame “wings” is a C-shape kitchen with inky-dark painted-plywood cabinetry echoing the exterior siding. Natural timber accents, both inside and out, have a yellowish cast: the blackbird’s beak, if you will. Punctuating the upper level’s glazed wall is a quirky touch: a wooden portal that looks like the world’s smallest door—actually used to abet ventilation.